Partway through What Maisie Knew, there is a moment where Susanna (Julianne Moore) asks her daughter Maisie (Onata Aprile) ‘What are you thinking about?’ Maisie’s one-word reply, ‘Nothing’, demonstrates how different is our relationship to the central character in the film and the ‘tale’ (to use author Henry James’s term) upon which it is based. …Maisie had, however, at the very moment of this injunction much livelier curiosities, for the dream of lectures at an institution had at last become a reality, thanks to Sir Claude’s now unbounded energy in discovering what could be done. It stood out in this connexion that when you came to look into things in a spirit of earnestness an immense deal could be done for very little more than your fare in the Underground. Novelist and literary critic/theorist David Lodge (in his book Consciousness and the Novel) describes Henry James as ‘supremely a novelist of consciousness. Consciousness was his subject: how individuals privately interpret the world, and often get it wrong; how the minds of sensitive, intelligent individuals are forever analysing, interpreting, anticipating, suspecting, and questioning their own motives and those of others'. What makes What Maisie Knew challenging and enthralling in equal measure is precisely James’s painstaking charting of the moment-by-moment unfolding of a characters’ thought-processes, including their hypotheses about the thought-processes of others. During one passage between Maisie and her father, we are told that ‘while they sat together, there was an extraordinary mute passage between her vision of this vision of his, his vision of her vision, and her vision of his vision of her vision.’ This moment stands out for its explicitness, but the tale sustains this level of complexity (some might say convolution) for the majority of its duration. Lodge goes on to assert that the kind of consciousness that James specialises in ‘is precisely what film as a medium finds most difficult to represent, because it is not visible.’ It is true that to even approximate James’s particular narrative mode in the medium of film is fiendishly difficult, and the screenwriters and directors of What Maisie Knew do not really attempt to do so. Difficult, but certainly not impossible. The closest cinematic equivalent to Henry James is probably Max Ophuls, a filmmaker who was exquisitely sensitive to the subtleties and the possibilities of cinematic point of view. (Incidentally, an earlier film by the directing team of What Maisie Knew was a novel that had been previously adapted by Ophuls; Ophuls’s film was The Reckless Moment , McGehee and Siegel’s was The Deep End .) In one of the films that he made in Hollywood (Ophuls worked across two continents and many countries, and in many languages), Letter from an Unknown Woman (1948), Ophuls manages to give us an equivalent to the at least three perspectives that Wood detects in What Maisie Knew. 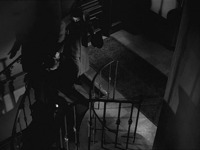 For example, there is a scene in which the protagonist Lisa (Joan Fontaine) and the object of her longstanding romantic fixation ascend the stairs to his apartment at the end of an enchanted evening together (their only one, as it will turn out). The moment is part of a long flashback, narrated by the protagonist as she lies on her deathbed (although at this particular narrative juncture, no words of hers accompany the action). What is more, we watch the couple ascend the stairs from the same vantage point where, in an earlier scene, we watched a younger Lisa watch the same man ascend with a different lover. Our at least three perspectives, then, belong to the film itself, as conveyed by its handling of cinematic point of view, to the older Lisa looking back, and to the younger Lisa, ‘in the moment’ below. Much critical debate has revolved around how to unpick and apportion the delicate ironies present in the sequence. To hold all fiction to the standards set by Henry James and Max Ophuls would be to set oneself up for near-constant disappointment. It is at least equally unfair to use an adaptation’s supposed lack of fidelity to a source text as a stick with which to beat it. However, one can heed such warnings and still compare the relative achievements, on their own terms, of source text and adaptation. The filmic adaptation of What Maisie Knew has a lot to recommend it, and in my short review I recommended it quite highly. However, next to the complexity of James’s tale - a complexity not only of a technical but also of a moral nature - its shortcomings cannot help but emerge. James’s Maisie’s attempts to comprehend and negotiate the often feckless and often inscrutable adults in her life are revealed not only by the narrated inner movements of her consciousness, but also by the things she says to those adults - things designed usually to please them, almost always with Maisie’s ‘inveterate instinct of keeping the peace’, but also sometimes (and more so as the tale progresses) with the aim of trying to arrange things as Maisie would like them to be (albeit often with disastrous miscalculations). Although less often praised than his free indirect style, James’s achievements in the crafting of revealing dialogue are also prodigious, and there are a great many exchanges where dialogue alone would be enough (in a screen or stage adaptation) to dramatise quite subtle chains and clusters of miscomprehension. The writers of the adaptation (Nancy Doyne and Carroll Cartwright) have chosen to jettison almost all of this material. Once again: it would be a critical error to upbraid them for this failure of fidelity. Also again though, it is legitimate to observe that the adaptation is, as a result, both less subtle and less penetrating. James’s Maisie is by turns awestruck, terrified, dumbfounded, pitiful, spiteful, calculating, compassionate, and more besides. The film’s Maisie remains, throughout, acted-upon; James’s Maisie moves from being at first a catalyst to ultimately a ‘player’ of the games that surround her, and sometimes an accomplice; in the final fifty pages or so of the tale more than one of her adult companions has occasion to wonder at the way in which they speak to and the things they share with this young girl. Although we are not meant to accept as justified Maisie’s mother ultimate denunciation of her daughter in the tale as ‘a dreadful dismal deplorable little thing’, we do understand where such a judgment comes from, and James’s project certainly does not depend upon Maisie being a saint. The film project, by contrast, does rather. Onata Aprile has received several plaudits for her performance as Maisie. Whilst I think these are entirely just, I also think that in the film, we generally take Maisie’s watchful silence for wisdom, and therefore take it, as it were, on trust. It is not only our perspective on the character that is different; the character herself is significantly altered. The film’s Maisie is self-contained and self-possessed in a way that the original Maisie is not. In James’s tale, we see the sometimes-ugly struggles of a young mind trying frantically to decipher what goes on around her; in the film, we have the more palatable and poignant spectacle of a young innocent who remains essentially untouched by the ugliness around her. The film, rather than being about what Maisie tries (and often fails) to understand about the adults around her, is centrally about what the adults notice (or more often, in several cases, fail to notice) about Maisie. The latter is probably in itself is a simpler fictional proposition than the former, and it brings with it simplifications in the characters of the adults and the criteria against which we are encouraged to judge them. One thing that the film does well is to dispense sympathy, and we know that Maisie’s parents love her. The crucial moral criterion for the film, though, is that they fail to attend sufficiently to their daughters’ needs. By contrast, Margot (Joanna Vanderham) and, especially, Lincoln (Alexander Skarsgård) straightforwardly and consistently offer Maisie the love and attention that she is straightforwardly and consistently capable of receiving. Would that life were so simple! It is certainly not so in James’s original. The film’s young and beautiful Lincoln has his origins in the tale’s also young and beautiful but nowhere near as constant Sir Claude (a man who is described with some accuracy by another character as being a slave to his passions). Moreover, the young and beautiful Margot is the folding together of two characters in the tale who remain at loggerheads to its bitter end: Mrs Beale, née Overmore, Maisie’s young and beautiful governess-then-stepmother, then the object of Sir Claude’s affections, and Mrs Wix, who is devoted to Maisie but sniggered at (and worse) by most of the rest of Maisie’s circle for her appearance and social station. In James’s tale, the messiness of adult relationships is a universal, and a constant presence from the first to the last page; in the film, it is exclusive to relationships involving one or both of Maisie’s parents, and all that is required, it seems, is for the beautiful young people to extricate themselves from their misjudged associations with the ageing selfish people (ie. 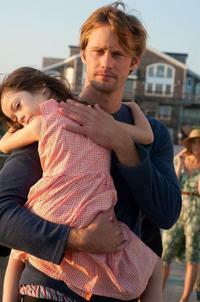 Maisie’s parents), and take the child with them, and then their happy ending can truly begin. We might pause to wonder what made those ageing selfish people the way they are. There is one scene where Lincoln, whilst he makes Maisie a sandwich, gently imparts the message that there is more to life than money. This is indeed so, but there is nevertheless a touch of bad faith in the way that the film ends with an idyll that wishes away economic constraints, making it, to use a pressing contemporary term, unsustainable. Margot has taken Maisie to a bucolic seafront property that, as luck would have it, is the unoccupied property of a relative. In other fiction, the ocean is a place of last resort, where one goes when all the options have run out (Les Quatre cent coups  being possibly the most famous example). Here it registers more as a ‘green world’ where problems are resolved before one returns, transformed, to one’s life. Margot was Maisie’s nanny; now she is her adoptive mother. In James’s day, and in his circle, the term was ‘governess’, and part of his tale’s subtlety is his exploration of the elaborate and formidable codes which governed when and under what circumstances one might renegotiate one’s social status, and move from being a family servant to a family member (and, of course, the equally formidable rules of conduct governing sexual relationships and divorce). Although we still have a long way to go, we have come some way, in these respects, from James’s time (a social gain which can sometimes manifest itself as an artistic loss: social conventions and their navigation make for great art, and although I enjoyed the updating of James to an upper middle class New York setting, I also felt this loss). But the underlying economic question remains, especially given the film’s main setting of well-to-do Manhattan. James relentlessly ‘places’ his characters in almost every way one can imagine, including economically. For McGehee and Siegel, if Maisie has, at last, found two people who love each other and also love her, not only in word, but in deed, then other questions can be left to hang. This is both laudable in its sentiment and culpable in its lack (refusal?) of clear-sightedness. James’s tale is not only about consciousness but also about knowledge. It is tempting to say, niggling though it sounds, that the film would be better with a different title, given that its perspective on what Maisie knows is so much lesser than its source text’s. Maisie’s knowledge is not the only type of knowledge at stake though. James once offered the advice ‘Try to be one of the people on whom nothing is lost.’ In contrast to this unrelenting, truth-seeking gaze, there appear to be some pressing areas of human complication, difficulty and messiness that the film is prepared to gloss over or wish away, and some pressing questions that it is prepared to leave unanswered. This Alternate Take was published on October 08, 2013.